"I remember the first time I ever saw Gypsy's Acre..."
Agatha Christie's novel Endless Night was, supposedly, one of her favorite books out of all the material she wrote. Christie, of course, was the woman who brought tons of suspense and murder mysteries to the masses, including characters like Miss Marple and Hercule Poirot. Though I've never been a big fan of classic murder mysteries, Christie is a cunning author, certainly proven by this film interpretation of Endless Night. The key to this movie, though, is that one must remember it is NOT a classic 'whodunit.' The film seems to market itself as if it is, and makes good use of Agatha Christie's name, but this psychological thriller is anything but a traditional murder mystery. The story opens with the central character, Michael (Hywel Bennett), relating the story of his life in flashback. Living in England, Michael works as a chauffeur for extremely wealthy and prominent clients. Desperate to break his bonds with mediocrity, though, he often pretends at being part of the upper crust as well. Eventually, when his snobbish attitude towards his clients gets him fired, he assumes that his life's dream is destroyed. His dream? To own a lovely house in a beautiful portion of England known as "Gypsy's Acre." As he visits the place one day, he comes across Ellie (Hayley Mills), a wealthy heiress who, like Mike, shares a desire to live at Gypsy's Acre. They eventually strike up a romance and, before long, wind up married. Michael now finds himself tied to considerable wealth and can now afford this dream house. His life has finally shaped up into exactly what he planned it to be. That is, until, he encounters Ellie's family; a strange collection of snooty, paranoid, unusual people. Among this lot is Ellie's friend, Greta (Britt Ekland), a former maid for the family who specializes in taking over wherever she is invited to stay. Endless Night is basically a subtle love story that evolves into a clever psychological story about the situation that Michael has found himself in. Someone is trying to put kinks into Mike and Ellie's relationship, but who is it? Who would benefit? The advertising for the film claims that only "3 out of 100 people" guess the actual truth behind the story. I'd probably wager more like 1 out of 100. Christie's brilliance at creating clever plot devices and small details to look for is plainly evident here. The patient and observant viewer will most definitely get more out of the film. It is also very generous with style, using wonderfully composed camera shots and cinematography. Set design is also very key to the immersion of the story, especially in the case of Michael's "dream home." An effective musical score by the legendary Bernard Hermann also adds to the style. Roles are extremely well-filled by very capable actors; everyone fits their part. The supporting cast has a few recognizable faces from English cinema, like George Sanders and Lois Maxwell (Mrs. Moneypenny in the Bond films). Hywel Bennett is excellent in the lead role as the confident and occasionally nasty Michael. Hayley Mills and Britt Ekland make good female leads and believable characters. Overall, Endless Night is a clever story that's crafted and paced very well, so as not to become too boring or stale. As I said, it's not really in the same vein as Agatha Christie's traditional stories, but it shows her prowess at using sly twists to surprise viewers. Image Transfer Review: The film itself is very grainy, leading to some noticeably harsh details in some scenes, but the transfer itself does well by not aggrivating the source flaws. There is very nice color balance and very accurate, well shaded black levels. Extremely nice image depth rounds out the transfer. Audio Transfer Review: The original mono is presented in a Pro-Logic format. Everything is well-balanced and the source is very clean and clear. The musical score sounds pretty rich for a mono soundtrack. While not a surround experience, the audio certainly does the job. Extras Review: The only extra feature on the disc is an original trailer (which is anamorphic and in reasonably decent condition). The keepcase insert features a short biography of Agatha Christie, written by Avie Hern. 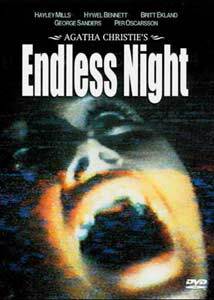 Endless Night is a rewarding, interesting thriller that certainly deserves a look by any fan of psychological mysteries. Highly recommended.